The role of data fusion has been expanding in recent years through the incorporation of pervasive applications, where the physical infrastructure is coupled with information and communication technologies, such as wireless sensor networks for the internet of things (IoT), e-health and Industry 4.0. In this edited reference, the authors provide advanced tools for the design, analysis and implementation of inference algorithms in wireless sensor networks. The book is directed at the sensing, signal processing, and ICTs research communities. The contents will be of particular use to researchers (from academia and industry) and practitioners working in wireless sensor networks, IoT, E-health and Industry 4.0 applications who wish to understand the basics of inference problems. It will also be of interest to professionals, and graduate and PhD students who wish to understand the fundamental concepts of inference algorithms based on intelligent and energy-efficient protocols. Critical systems and infrastructure rely heavily on ICT systems and networks where security issues are a major concern. Authentication methods verify that messages come from trusted sources and guarantee the smooth flow of information and data. In this edited reference, the authors present state-of-art research and development in authentication technologies including challenges and applications for Cloud Technologies, IoT and Big Data. Topics covered include authentication; cryptographic algorithms; digital watermarking; biometric authentication; block ciphers with applications in IoT; identification schemes for Cloud and IoT; authentication issues for Cloud applications; cryptography engines for Cloud based on FPGA; and data protection laws. Electroencephalography (EEG) is an electrophysiological monitoring method used to record the brain activity in brain-computer interface (BCI) systems. It records the electrical activity of the brain, is typically non-invasive with electrodes placed along the scalp, requires relatively simple and inexpensive equipment, and is easier to use than other methods. EEG-based BCI methods provide modest speed and accuracy which is why multichannel systems and proper signal processing methods are used for feature extraction, feature selection and feature classification to discriminate among several mental tasks. This edited book presents state of the art aspects of EEG signal processing methods, with an emphasis on advanced strategies, case studies, clinical practices and applications such as EEG for meditation, auditory selective attention, sleep apnoea; person authentication; handedness detection, Parkinson&apos;s disease, motor imagery, smart air travel support and brain signal classification. A liquid-crystal display (LCD) is a flat-panel display or other electronically-modulated optical device that uses the light-modulating properties of liquid crystals. Liquid Crystal Displays are already widely used in consumer electronics, but research and development is still ongoing. The shifting focus of research follows a pattern of improved definition, increased display size, wider viewing angles and faster responses, with improvements in each area influencing the next. There is also growing interest in the use of liquid crystal materials in novel applications including sensing devices, spatial modulators and light-shielding windows. This book discusses the latest LCD technologies, with their challenges, opportunities, and problems to be solved, at a level suited to an academic and research-professional audience. There is a particular focus on display quality such as image sticking, contrast ratio and colour hue that has not been dealt with thoroughly elsewhere. Current and future trends in liquid crystal materials and technologies based on their evolving role and new applications are discussed in detail. Modern network systems such as Internet of Things, Smart Grid, VoIP traffic, Peer-to-Peer protocol, and social networks, are inherently complex. They require powerful and realistic models and tools not only for analysis and simulation but also for prediction. This book covers important topics and approaches related to the modeling and simulation of complex communication networks from a complex adaptive systems perspective. The authors present different modeling paradigms and approaches as well as surveys and case studies. With contributions from an international panel of experts, this book is essential reading for networking, computing, and communications professionals, researchers and engineers in the field of next generation networks and complex information and communication systems, and academics and advanced students working in these fields. IP Core Protection and Hardware-Assisted Security for Consumer Electronics presents established and novel solutions for security and protection problems related to IP cores (especially those based on DSP/multimedia applications) in consumer electronics. The topic is important to researchers in various areas of specialization, encompassing overlapping topics such as EDA-CAD, hardware design security, VLSI design, IP core protection, optimization using evolutionary computing, system-on-chip design and application specific processor/hardware accelerator design. The book begins by introducing the concepts of security, privacy and IP protection in information systems. Later chapters focus specifically on hardware-assisted IP security in consumer electronics, with coverage including essential topics such as hardware Trojan security, robust watermarking, fingerprinting, structural and functional obfuscation, encryption, IoT security, forensic engineering based protection, JPEG obfuscation design, hardware assisted media protection, PUF and side-channel attack resistance. The needs of future digital data and computer systems are expected to be two to three orders of magnitude larger than for today&apos;s systems, to take account of unprecedented amounts of heterogeneous hardware, lines of source code, numbers of users, and volumes of data. Ultrascale computing systems (UCS) are a solution. Envisioned as large-scale complex systems joining parallel and distributed computing systems, which can be located at multiple sites and cooperate to provide the required resources and performance to the users, these technologies will extend individual systems to provide the resources that are very much needed. Based on the research work in the COST Action IC 1305 Network for Sustainable Ultrascale Computing (NESUS) this book presents important results and methods towards achieving sustainable UCS. The authors present a wide range of emerging programming models that facilitate the task of scaling and extracting performance on continuously evolving platforms, while providing resilience and fault-tolerant mechanisms to tackle the increasing probability of failures throughout the entire software stack. These methods are needed to achieve scale handling, better programmability and adaptation to rapidly changing underlying computing architecture, data centric programming models, resilience, and energy-efficiency. Swarm Intelligence 3 Volume Review - now available from IET Books. A new, comprehensive review on the principles of current and new swarm intelligence algorithms, inspiring new insights and applications. Healthcare Technology Letters now publishing as Gold Open Access. All article processing charges will be waived for papers submitted in 2017. 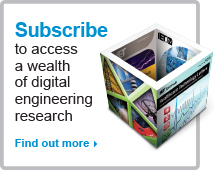 IET Author URLs - Share your work for FREE. Find out more. Professor Chris Toumazou, co-Editor-in-Chief of IETs prestigious Electronics Letters, has been featured in "Electronics Weekly"
Access 6500+ engineering and technology videos on the new IET.tv platform. Find out more and read the full press release here.